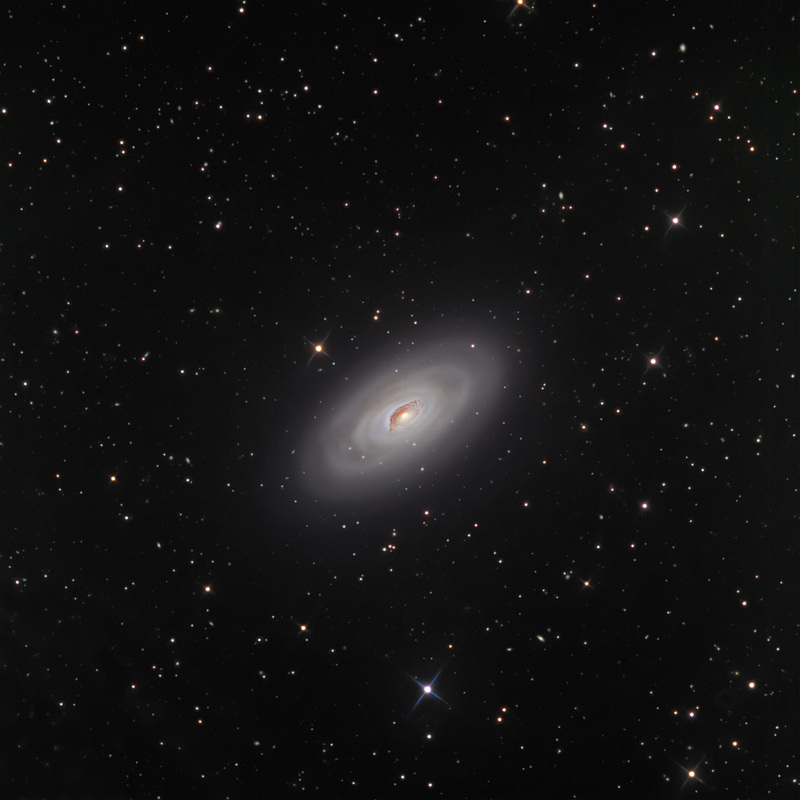 Messier 64 has a prominent dust structure first observed by William Herchel in 1785, who referred to it as a "Black Eye". The galaxy has thus been known as the Black Eye galaxy. It is a bright (mag 8.5) spiral galaxy located in Coma Berenices at RA 12hr56.7min and DEC +21deg41min at an estimated distance of 19 million light years. The dark dust region is easily observed, even in smaller telescopes. It has two counterrotating systems of stars and gas and is a region of active star formation, as shown by the blue knots. It is thought that M64 is a result of a collision of two galaxies, perhaps a billion years ago that gave rise to the oppositely rotating regions. The image is ~ 40′ x 40′ and North is up and to the left. The plate scale is ~ 0.52"/pixel and the seeing was ~2.5". Astrodon Gen 2 LRGB filters were used. The system was guided with an SBIG ST-402 camera in an Astrodon MonsterMOAG off-axis-guider. CCDAutoPilot4 running Maxim4.62 was used to collect data automatically. Processing was done in CCDStack and Photoshop CS3.